Fool me once, shame on you. Fool me twice, shame on the Australian government. Once again, toxic waste from Clive Palmer’s nickel refinery near Townsville is threatening to spill into the Great Barrier Reef and local waterways. This comes only weeks after newly released documents revealed that the refinery had purposely leaked toxic waste into the reef waters on several occasions from 2009, despite being strictly forbidden to do so by the Marine Park Authority. The documents show that the State Government was concerned with what it considered “ongoing problems with capacity of the water management system” at the plant, which can easily overflow during heavy rain. The heavy rains which accompanied Cyclone Ita have caused storage dams to reach capacity and the chemical laden water to breach the holding. The contaminated water is a by-product of the refining process and is laced with heavy metals and extremely high levels of nitrogen. According to a State Government spokeswoman, “water is flowing over the spillway into a downstream water management system”, deeply worrying given the refinery’s position adjacent to the reef waters. Inspectors were sent to the refinery and Queensland Environment Minister Andrew Powell advised that they were “extremely concerned” about the potential for a toxic leak into the reef. Yesterday, government officials advised that the refinery had been shut down temporarily to ensure no further waste water was produced. In addition, Palmer has threatened to sue the GBR Marine Park Authority if they pursue legal action against him for discharging waste into the reef. In a statement, the Great Barrier Reef Marine Park Authority said: “We have strongly encouraged… options that do not entail releasing the material to the environment and to develop a management plan…; however, GBRMPA does not have legislative control over how the Yabulu tailings dam is managed.” This is the responsibility of the QLD government, who have asked Palmer to expand the containment ponds by November to prevent overflow, or face a $1.1 million fine. To billionaire Clive, this fine is mere pocket change. Given his blatant disregard for previous restrictions imposed on his refinery, I am doubtful that he will comply with this one. 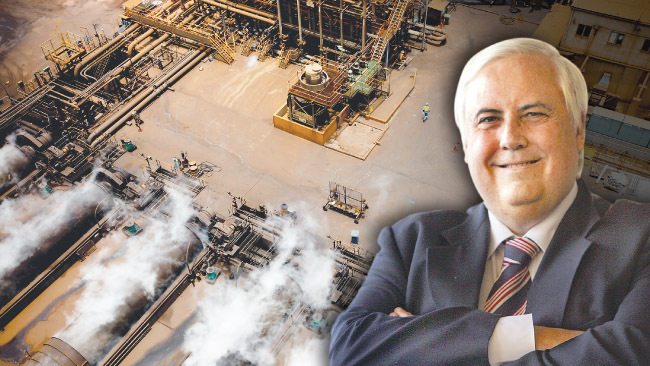 Despite repeated environmental breaches at the refinery, Palmer has never been fined or charged, and continues to get away with just a slap on the wrist. Clive Palmer is an egotistical bully who has somehow managed to buy himself a political voice, which is nothing but a sad reflection on the state of Australian politics today.